PXI Chassis, 9-Slot PXI Express 3U Chassis - GX7600 | Marvin Test Solutions, Inc. The GX7600 Series mainframes are compact, 9-slot PXI chassis that can accommodate up to 8 instruments as well as an embedded single slot cPCI Express controller such as the GX7944 or a PXI Express external bus controller such as the x1 or x4 MXI - PXI Express interface. The GX7600’s compact 3U form-factor occupies only 9 x 18 inches of bench space, making it ideal for benchtop or space constrained applications. And when combined with 8 peripheral slots, integral Smart functions, and the bandwidth of PXI Express, the GX7600 represents a new level of performance, capabilities and value for PXI mainframes. System power for the GX7600 Series is provided by a single power supply configuration that provides 550 watts of system power. Forced-air cooling for the chassis is provided by two 79 CFM fans located under the card cage with a separate fan providing cooling for the system power supply. Based on internal chassis temperature, chassis fan speed is automatically adjusted, minimizing acoustic noise emissions. The chassis’ cooling configuration provides airflow for all module slots per the PXI specification and requires no additional rack space for inlet or outlet air. Like all Marvin Test Solutions' PXI chassis, the GX7600 incorporates Smart functions, which supports the monitoring of slot temperatures and system power supply voltages. In addition, the user can program the temperature monitoring function for specific warning and shutdown limits. All user specific setups can be stored in nonvolatile memory as a user configuration and can be used as the default setup for normal chassis operation. All Smart functions are available with master or slave chassis configurations. 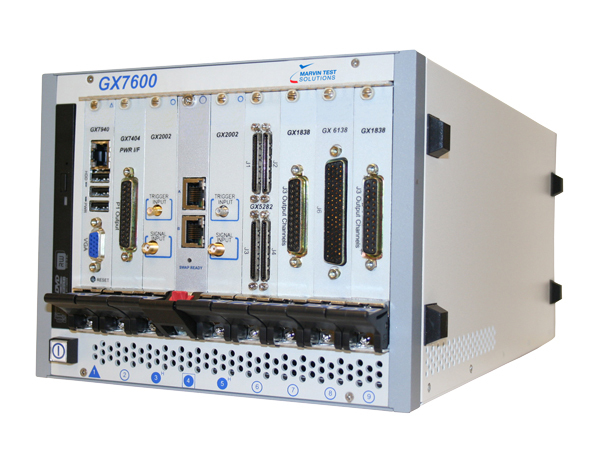 The nine-slot layout of the GX7600 consists of five PXI slots, two PXI hybrid slots, one PXIe timing slot, and one cPCIe controller slot. The PXI backplane supports a x4 PCI Express lane configuration for the two hybrid slots and the system timing slot, providing an aggregate bus bandwidth of 3 GB/s. An additional x1 PCI Express lane interfaces to a PCI bridge device for support of the 5 PXI slots. Full support of the PXI Express timing, triggering, and synchronization resources is provided including support for the PXI Express system timing slot. The chassis is supplied with the GxChassis software which provides software libraries and a driver, programming examples, virtual panel application and documentation. The virtual panel provides a way to control, configure and display the smart chassis' features, including temperature monitoring, trigger line mapping, and power supply voltage monitoring. A 32/64-bit Windows DLL driver is provided with various interface files for accessing the DLL functions from programming tools and languages such as ATEasy, LabVIEW, C/C++, Microsoft Visual Basic®, Delphi, and more. A User's Guide provides documentation that includes instructions for installing, using and programming the chassis. Temperature Monitoring Integrated temperature monitoring via an on-board microcontroller with audible and software notification when preset temperature limits are exceeded.